Incredible Cajun food, southern hospitality, and Mardi Gras: Louisiana offers a culturally rich and ethnically diverse setting to pursue medicine. With larger cities like New Orleans, and smaller towns like Lake Charles, regardless of what type of community you want to serve, Louisiana attracts hopeful applicants from across the nation. According to the Health Resources and Services Administration, over 30% of the state’s population resides in a primary care health professional shortage area. If you are considering a primary care field, Louisiana is hoping to attract future clinicians. To determine your competitiveness for a Louisiana medical school, you must review the average MCATs and GPAs for accepted students as well as the medical school acceptance rates. For out of state students, it is important to pay attention to how many out of state students are interviewed and what percentage are in the entering class each year. So, how difficult is it to get accepted into a Louisiana medical school? Let’s review the data. Below are the average MCAT scores and GPAs, interview rates for in state and out of state applicants, acceptance rates, percent of entering class that is in state, and tuition for all medical schools in Louisiana. 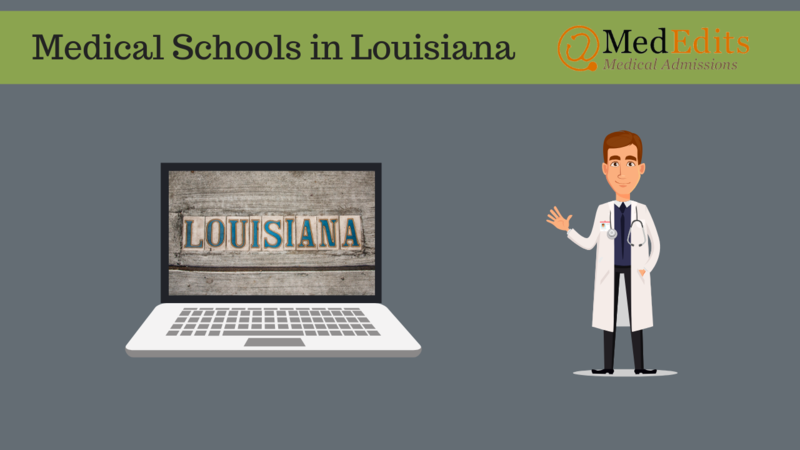 Considering applying to medical schools in Louisiana? Sign up for a FREE 15 minute advising session with an admissions expert. How Competitive are you for Medical School Admissions in Louisiana? So, what can you do to increase your chances of getting accepted into a Louisiana medical school? Louisiana medical schools offer a broad range of GPAs and MCAT scores, so when evaluating how competitive you are, be honest with yourself. Are your MCAT and GPA close to the metrics for accepted students? If not, consider retaking your MCAT or enhancing your GPA. Although Louisiana does not currently have an osteopathic medical school, the University of Louisiana announced a partnership with Edward Via College of Osteopathic Medicine in 2018 with plans to open a new medical school in 2020. As far as MD schools are considered, students should take note whether a school is private or public. Because Tulane University is a private medical school, it matriculates a higher percentage of out-of-state students. There are also differences in terms of tuition when it comes to private versus public medical schools. It is also worth mentioning that both Tulane University and Louisiana State University Health Sciences Center-New Orleans have fairly large first year class sizes, over 190 students. The Louisiana State University Health Sciences Center-Shreveport has a much smaller class, about 135 students. Consider the benefits and drawbacks associated with both types of medical schools. Smaller medical schools may give students a better sense of community, with the faculty and administration knowing each student by name. Whereas larger schools can mean more opportunities, like more choices for rotations. Try to imagine your perfect medical school atmosphere, and remember that the size of the medical school influences learning opportunities. What is certain is that Louisiana boasts several options for hopeful applicants!